Dioramas and Clever Things: Antique Store.....by default! As a follow up to the previous posting I present another model I made around the same period (when I was 15 or so). This one was made, by default, into an antique store. By default meaning it was one way I could think to put a lot of unconnected pieces I had built or acquired into one model. I recall that the box was an old milk crate (when they were still made from wood) that came from my grandparents' cellar in the country. Other details I can recall are that I made the ship on the back wall using a toothpick for mast, that the famous Emanuel Leutze painting, Washington Crossing the Delaware, is a postage stamp (this was around the time of the Bicentennial) and that the parasol hanging from the ceiling came from a cocktail, probably a pina colada or something like that. The sword on the back wall is from a GI Joe doll set and the racing car on the back shelf - can anybody recognize it - is a Monopoly piece! 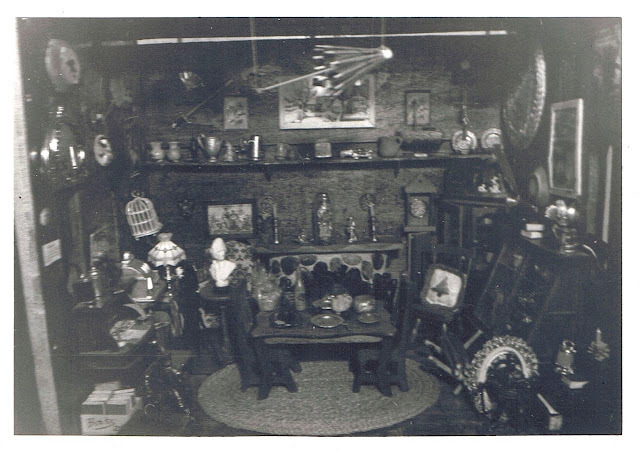 There were also a few personal touches including a pillow made by my favorite aunt (with the Christmas tree) and there is a picture of my grandmother (the one who had the cellar with the crate) on the lower right part of the model (obscured) in the ornate oval frame. As with the general store in the previous post, there is a certain charm in seeing this model in black and white. That's a lovely scene, would enjoy having a good rummage through the piles of things. nice to see it, hope you eventually find the model again too!